What Is A Rhinoplasty / Nose Job? A rhinoplasty, commonly referred to as a “nose job,” is a surgical procedure that reshapes the nose. It is one of the most commonly requested plastic surgery procedures and something that I perform routinely in my practice. Rhinoplasty is a true from of plastic surgery art and only after having performed rhinoplasty for 3 decades do I consider myself a reputable surgeon for this critical undertaking. It’s one of my areas of expertise and a procedure that I truly love to perform. 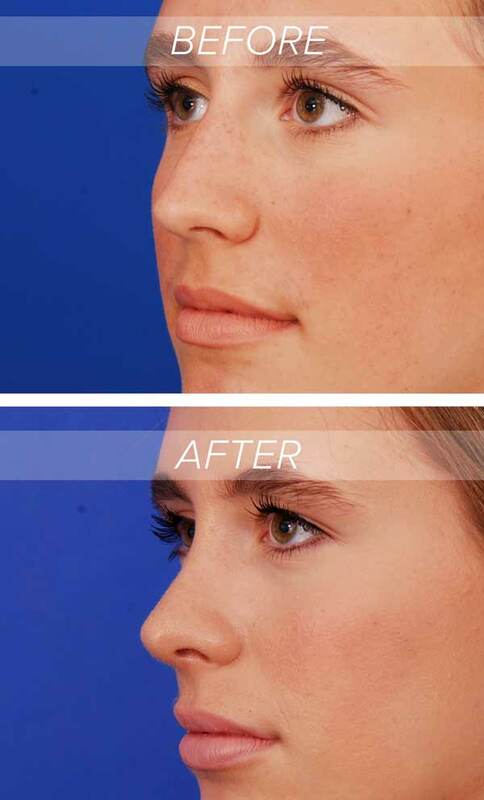 Take a look at this before and after rhinoplasty gallery. Most patients seek nose refinement options because they want a smaller nose with a better shape. It is one of the most intriguing and challenging cosmetic surgery procedures that I perform. The reason is, in part, because the nose is the center of the face and changes in its structure can have a profound effect on your general appearance. Patients typically desire a lowering of a nasal hump, a narrowing of a nose that is too wide, and refinements to an unshapely or unflattering nasal tip. The ultimate goal of a well performed rhinoplasty is to shape up the nose of your liking without the drama associated with the “botched” nose jobs that we all know exist. Natural is in — patients want a nose that is not artificial or “overdone” in any way. They want to look like themselves but with a more balanced, elegant nose that fits their face. It’s critical that you and your surgeon are on the same page when it comes to exactly what you are looking for. Patients are not always familiar with the terms used by surgeons and patients may find it difficult to find the right words. Bringing in photos from the Internet or magazines will help your surgeon determine your goals and to ensure that your expectations are realistic based on your individual nasal anatomy. Happy results come from patients whose goals have been achieved. A rhinoplasty is performed by adjusting the underling bony and cartilaginous structure. Cartilage is trimmed and changed in shape with sutures, bone is rasped and reshaped so the combination forms a balanced, elegant nose that fits the patients face. It’s important to remember that a nose is there to breathe as well as to look attractive. To ensure normal breathing adjustments can be made internally (to the septum and turbinates) during a rhinoplasty if necessary. Always inform your doctor of any allergies or breathing issues that you may have or medications that you are taking. A rhinoplasty is an outpatient procedure performed in my office operating facility. In most cases, a standard rhinoplasty procedure takes about 2 hours or less to complete. Anesthesia is used for your comfort and safety. Treatment is directed both to the outside as well as the inside depending on the anatomy. Most procedures are performed though a small incision on the narrow part of the columella. This allows for unsurpassed exposure of the internal anatomy so appropriate changes can be made that will result in a beautiful face. Send Dr. Caridi pictures of your nose and he’ll get back to you with his opinion. The initial recovery from a rhinoplasty is about 1 week. The splint, Steri strips and sutures will be removed after 5-7 days. Although the nose will be swollen and your lower eyelids can be bruised, you will immediately appreciate the changes. The nose will continue to change in shape for up to two years after treatment so patience is needed as the swelling subsides and the healing progresses. Breathing through the nose can be a challenge for several weeks afterwards because of the swelling. The tip will feel numb for several months. Pain is minimal with a nose job — it’s more of a “stuffy” feeling from the swelling. Bruising of the lower eyelids can take up to two weeks to resolve. Icing for the first 3 days goes a long way to minimizing the swelling and bruising after treatment. Ice packs and cold compresses should be used round the clock during this early recovery. Makeup comes in handy. Pain medication can be used for several days if desired. Small nasal pads placed in the nostrils after treatment are usually removed the next day at home. Nasal toilet refers to treatments to the inside of the nose to speed recovery and enhance breathing and decrease congestion. This often entails the use of saline washes to remove blood and debris as well as nasal decongestants to help with swelling and drainage. Keeping your head elevated above your heart helps with swelling. Don’t drink a lot of fluids thinking it will make you heal faster—it just adds to the swelling. Try not to blow your nose for a week or so afterwards. If you experience any bleeding afterwards put your head back and hold the tip of the nose with some gauze or Kleenex and relax until it stops. Athletic activities can be resumed about 10 days after surgery. It is advisable to avoid any activity that may result in trauma for six weeks afterwards (volleyball, boxing, soccer). Internal healing will be mostly complete after several weeks, but a direct blow may alter the surgical result. The central face may swell during and after physical activity for up to four months afterwards. The reaction from others should be subtle. It’s interesting that friends, family and your “peeps” may know something is different about your appearance but not know why. Our eyes are trained to see the “unexpected”, so when the nose has nothing but normal features it almost becomes invisible. People will notice a nose that is too large for your face, a big hump that is very noticeable on profile view, a tip that is wide and unrefined or a crooked nose. Take care of these visible “unexpected” features and the nose will disappear of sorts. This is the “art” of facial cosmetic surgery. It’s all about taking that “selfie” and enjoying what you see! Some noses are easier than others. I always get excited when I know that changes can be made and the results are predictable and reliable. Patients with very thick skin or problematic anatomy pose a challenge for even the most experienced surgeons. Because of my vast experience, it’s easier for me to inform patients about what they can reasonably expect after treatment. A rhinoplasty surgeon can only work with the nose you give them. It’s generally not possible to shape a nose like your most beloved celebrity because of the limits of the tissues and the underlying bone and cartilage. Michael Jackson wanted something that was impossible and he paid a high price for his unrealistic expectations. The good news is that many patients have learned from his rhinoplasty dilemma and their expectations are much more realistic. A typical rhinoplasty needs to be a balanced procedure. It would be relatively uncommon to change one area of the nose and not include other areas so the result is balanced and proportional. The best example is a procedure to refine the nasal tip alone without narrowing the nasal bones and adjusting the dorsum so the result is smooth and even. As a general rule, a rhinoplasty is a conservative procedure. Adjustments are made in millimeters and not big sweeping changes. This is something that experienced surgeons have learned over decades of observation. You want to avoid an “overdone” appearance. Too much tissue removed and the nose simply loses the normal features. Worse, there can be a “ski jump” roof or an overly rotated nasal tip (pig nose) that nobody has time for! If the nose looks quite small immediately after treatment it can look really odd years down the line as the nose continues to evolve and change. The psychological adjustment to your new nose is very dependent on your personality and expectations. It should never be a shock. You should see nice improvements immediately and you should remind yourself that the nose takes quite some time before the finished product appears. You need to be patient as the healing process takes many months and isn’t over until about 2 years! It’s the gift that keeps giving because as the swelling subsides the subtle features will become evident. The nose can develop some asymmetries during this time as swelling reduction can be uneven. This will equalize over time. Don’t torture yourself after treatment by staring in the mirror. You will adjust to your new nose over time — be patient. Fortunately, complications immediately after rhinoplasty are uncommon. Bleeding is always a possibility as is an infection. Make sure you tell your doctor if you are taking any medications that enhance bleeding (aspirin, fish oils and others). Believe it or not, the biggest issue with nose jobs is getting the result that makes the patient happy. The reason for dissatisfaction is often not due to a problem with the actual conduct of the procedure but patients expectations and how they deal with their new nose. There is a lot of psychology involved. Fixing a nose that has previously been operated upon (rhinoplasty revision) is a challenge at an entirely different level. Best to get it done right the first time than to have to go back again. The results are less predictable and often cartilage grafting is needed to address the compromised underlying anatomy. Choose your surgeon wisely. Practice and experience truly matters. Dr Caridi offers consultations online. Take photos of your face and get a free nose job cost quote – without leaving home! What Is The Cost Of A Rhinoplasty / Nose Job? The cost of rhinoplasty varies with the complexity of the case, where you live and your surgeon. For example, a revision nose job always costs more because of the increased complexity. Internal work adds cost to the procedure as well (work on the septum or turbinates). If cartilage grafting is needed this entails the harvesting and processing of the cartilage and this will certainly require more time for the procedure and greater surgeon skill. The best way to get an idea of the cost of a rhinoplasty in Austin, Texas from Westlake Plastic Surgery is to submit a convenient Virtual Online Consultation. In summary, a rhinoplasty in experienced hands is a wonderful procedure to enhance your appearance and improve the shape of your nose. Fear of “botched nose jobs” is always a patient concern as it should be. For this reason you have to always put yourself into the hands of the most qualified surgeons and be aware of those surgeons who only occasionally perform this delicate procedure.